Richard is a range of sofas with wide dimension, distinguishable for the simplicity and extraordinary of the line together with the comfort of the cushions. The inner wooden structure is equipped with elastic belts and a wide range of upholsteries and cushions with high density foam and goose feather are available. Proposed in the version with 3 seater, 2 large seats place and ottoman. 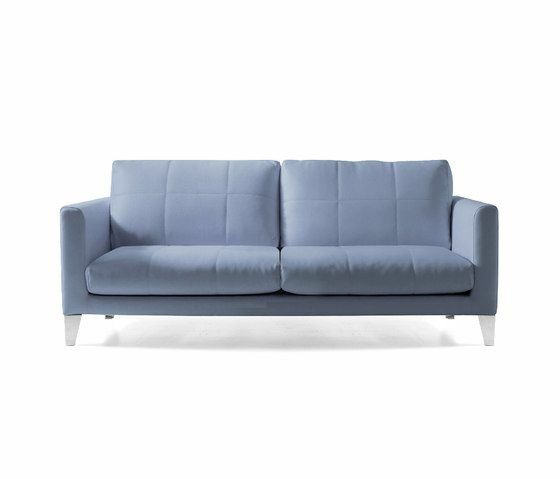 Richard sofas are conceived for the domestic environment, office and waiting areas as well. The cushions can be upholstered in all leathers and available fabrics of Quinti colours system. 3 different kind of feet are available: square chromed stainless section, 25x25, metal chromed high thickness coned shape or solid oak wood in natural finish or moka.